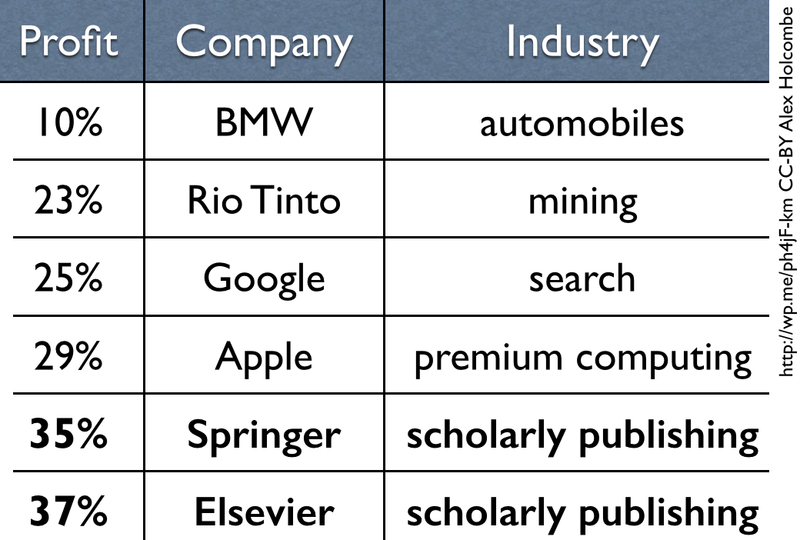 I made the below slide for a talk in 2012 to show that the biggest corporate scientific publishers are outrageously profitable. But that was 3 years ago. How do they look now? The 40% figure for Wiley in my original slide at left may have been “overinflated”, as a helpful someone explained on twitter. The issue is that the figure (which I got from Heather Morrison’s thesis) did not have costs subtracted from it (as Heather explained to me later), unlike had been done for the other companies to yield operating profit. Subtracting the costs yields a much lower profit of about 20%. This revised figure is however an underestimate in that it doesn’t include the profits sent to societies that many of the journals were published in partnership with. But because Wiley has not released detailed numbers since 2012, I have dropped them from this update. In my updated table (below), Rio Tinto’s operating profit margin is at 23%, based on 11.3 billion in operating profit and 47.7 billion in consolidated sales revenue (p. 27 of their media release) in 2014. The 10% operating profit figure for BMW reflects their 2013 revenue of 76B and operating income of 7.85B. I didn’t find more recent figures, but indications are their profit hasn’t changed much. Google’s profit was 25% for 2014. Income from operations was 16.5B, with revenue of 66B, according to their 10-K.
Apple at 29% for the year ending 27 Sep 2014 reflects operating income of 52.5B on net sales of 182.2B from their 10-K.
Springer seems to have not released detailed numbers since 2012, but in 2012 they wrote that sales were 981.1m euros, with EBITDA of 342.8m for margin of 35%. EBITDA and operating profit differs in the inclusion of non-operating income, but I suspect that non-operating income was fairly negligible. Elsevier’s journal publishing business is in its Scientific, Technical, & Medical division. That division reported, for 2014, an adjusted operating profit of 762£m on 2,048 £m in revenue, or 37%. Their 2013 margin was also 37%. Because it’s difficult to know and allocate costs, these numbers should only be considered as ballpark estimates, and I’m unlikely to update the tables each time someone arrives at a different figure. These Elsevier and Springer operations do more than publish journals. They also make money from a few other sources, such as databases of medical and legal information. Rather than their overall profit, we’d like to know how much they make from journal articles specifically. There’s no way to know this, because the companies don’t release this information. Elsevier even requires its universities to sign confidentiality agreements so that no one can know how much the price of the subscriptions are. How about open-access publishers? The Public Library of Science (PLoS) is the largest (by number of articles published). They don’t charge subscriptions, not making any money there, so anyone can read the articles they publish. However they do charge most authors, or ultimately the authors’ funders, a fee for each manuscript. Although they don’t make profits because they’re a non-profit organization, we can look at their numbers and calculate something like an operating surplus margin. PLoS last published detailed figures for 2013. They reported gross revenue and support of 46.87M (after waiving publication fees for authors who couldn’t pay). 2013 saw an increase in net assets of 9.87M, which is 21% of the gross revenue and support. The majority of their articles appear in PLoS ONE, which charges the authors $1350 per article. The surplus is eventually fed back into their operation, supporting further technological innovation in publishing, among other activities. 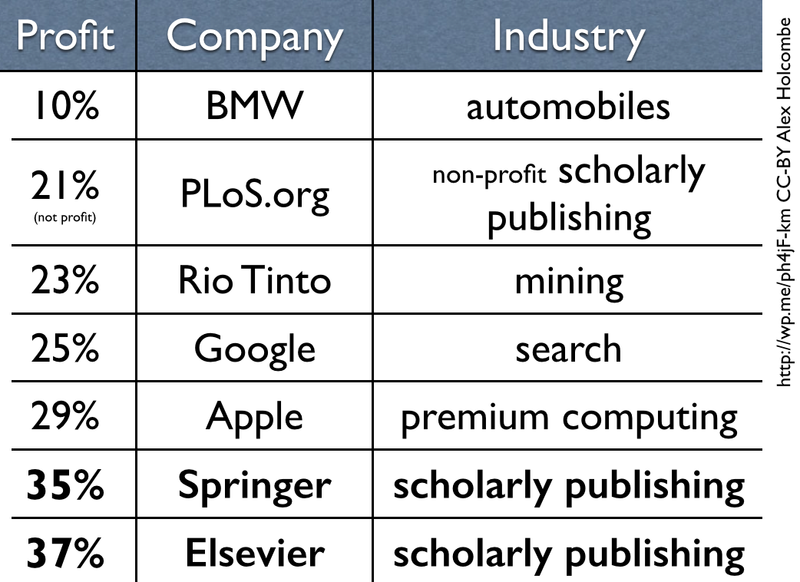 I therefore think they shouldn’t be lumped together with for-profit publishers, but some people have asked me to compare them to the for-profits, so in the alternate version of the table below, I’ve included PLoS. Hindawi charges only about $600 to authors to publish each article. Despite this relatively low cost, they make an extraordinarily high profit of something like 52%. This may reflect some shortcuts and short-changing in their provision of services. As Jeffrey Beall has written, “Hindawi is not on my list of questionable publishers. I do receive complaints about Hindawi, however. They use spam a lot, most of their over 500 journals lack editors in chief, and it seems to be a publisher that focuses just on the authors’ needs and not so much the readers’.” Many open access publishers probably earn even higher profits, due to still-worse behavior. These can be classified as predators who scam unsuspecting authors. While these profit figures show that the sciences clearly have enough money available to support publishing, the humanities are a different story. Many publishers in that area, such as university presses, are barely getting by, much like today’s newspaper publishers. So the large science, technology, and medicine publishers are outliers. Some, such as Elsevier, are still as fat as ever, suggesting that moves toward open access can go a lot further without endangering the provision of publishing services. Disclosure: I am an editor for the open-access Registered Replication Reports, a type of article that appears in Perspectives on Psychological Science, a journal published by Sage for the Association for Psychological Science. Sage is a private company that is not required to report its financials. I wasn’t able to find profit figures for them.